3. Listen to your neighbor. Listen to understand, not to reply. 4. When you speak to your neighbor, speak in love. Speak truth. Speak to delight. Speak to encourage. Speak to serve. 8. Create. Play music. Draw. Paint. Garden. 9. Make the world a more beautiful place. 10. Invite someone to join you. 11. Read a book that will enlarge your heart and imagination and place you in another person’s shoes. 13. Practice integrity. Practice it more. Even when no one is looking. Especially when no one is looking. 16. Don’t lie. Even when you don’t think you’ll get caught. 17. Smile at your children. Smile at strangers. 20. Be filled with gratitude for this astounding gift called life. This is beautiful. Thank you, Heidi. It's so true. 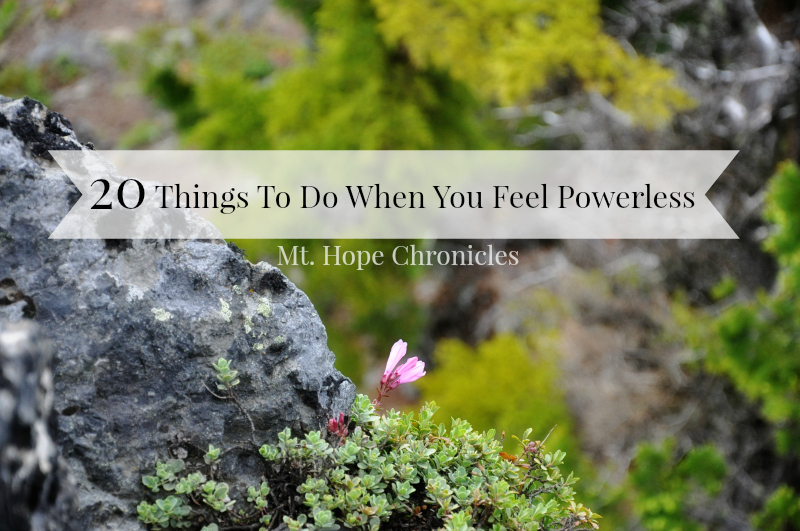 It is true that your said why we feel powerless. The post of your are very help and useful. Overcoming a challenge does remind you have that you have strength and power in Christ to overcome all obstacles. 'Practice integrity. Practice it more. Even when no one is looking. Especially when no one is looking.' Yes. This. Thank you for this post today.